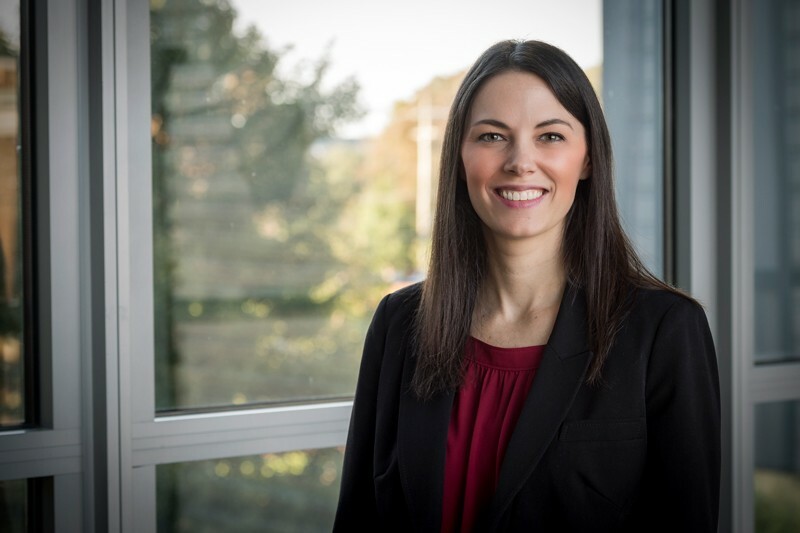 Emily Day, an assistant professor of biomedical engineering at the University of Delaware, was recently honored as one of the most promising young researchers in the entire field of biomedical engineering. On Oct. 17, 2018, she received the Rita Schaffer Young Investigator Award from the Biomedical Engineering Society, the premier professional society for biomedical engineers. “The general theme of my talk was that when you take therapeutic RNA molecules or antibodies, which can both regulate gene expression inside cells, and place them on nanoparticles in a three-dimensional manner, they are much more effective than if you deliver them freely,” she said. For example, Day’s research group recently demonstrated a new way to use the polymer polyethylenimine (PEI) to deliver gene-regulating RNA to cancer cells. PEI is a positively charged material that can join with negative RNA molecules to deliver them into cells, but these randomly assembled polyplexes are too toxic for clinical use. Her lab wrapped PEI around nanoparticles that contained specially arranged RNA. “By controlling the way the RNA and PEI were presented to the cells, we found that we could get better effects with less toxicity than with random assembly,” she said. They also found that these particles could be designed to silence GLI1, the mediator of a signaling pathway that drives the progression of glioblastoma, an aggressive form of brain cancer. In addition to her honor from the Biomedical Engineering Society, Day has been selected by the University of Delaware’s Francis Alison Society to receive the 2018 Gerard J. Mangone Young Scholars Award. The award recognizes promising and accomplished young faculty. The recipient is chosen by fellow faculty members who have received the Francis Alison Award, the University’s highest competitive faculty honor. In high school, Day was inspired by a science teacher who helped her appreciate the joy of learning something new and she now tries to pass that to her students at UD. Day was nominated for this award by Dawn Elliott, professor and chair of the Department of Biomedical Engineering. “Dr. Day’s research is highly significant to the field of precision medicine,” Elliott wrote in her nomination letter. Engineering students at UD directly benefit from Day’s expertise. In fall 2018, she is teaching Engineering Biomedical Nanostructures, an undergraduate course on nanoscale structures for biotechnical applications. In the spring, will teach a course on biomedical experiment design and analysis. She has advised three postdoctoral fellows and six doctoral students, and the undergraduates who do research in her research laboratory frequently win awards, publish papers, and go on to top-ranked graduate programs. Day, who grew up in Oklahoma, knew from a young age that she wanted to a be a professor and a scientist. Her father got a doctoral degree in physics, and her mother worked in education, and her passion for science and teaching were reinforced by her high school math and physics teacher, Francis Nine. She went to the University of Oklahoma, where she earned a bachelor’s degree in physics. A summer undergraduate research experience at Rice University’s Center for Biological and Environmental Nanotechnology introduced her to the field of nanomedicine that she is now a pioneer in. After graduating from the University of Oklahoma, Day returned to Rice for graduate school, earning a doctoral degree in bioengineering in 2011. She was a postdoctoral fellow at Northwestern University from 2011 until 2013, when she joined UD. Over the last five years, Day has garnered significant acclaim for her work. In 2018 alone, she has received not only the Mangone Young Scholars Award and Rita Schaffer Young Investigator Award, but also the 2018 Young Innovator in Cellular and Molecular Bioengineering, the Young Innovator Award in Nanobiotechnology and the NSF CAREER Award. In honor of former Biomedical Engineering Society (BMES) Executive Director Rita Schaffer, the Society established the Rita Schaffer Young Investigator Award in 2000. Rita Schaffer’s gift of her estate – along with contributions from her family, friends, and associates – enabled BMES to create this award. The Young Investigator Award is offered each year to stimulate research careers in biomedical engineering. The recipient presents the 20-minute Rita Schaffer Young Investigator Lecture at the annual meeting, and publishes the text of the lecture in the Annals of Biomedical Engineering. The award recipient must be within 7 years of receiving his/her highest degree. The Mangone Young Scholars Award is named in honor of the late Gerard J. Mangone, who joined the UD faculty in 1972 and created the UD Center for the Study of Marine Policy, renamed in his honor in 2003. Mangone, University Research Professor in the College of Earth, Ocean and Environment, received the Francis Alison Award in 1983. In 2010, he received an honorary degree from UD. He died on July 27, 2011.